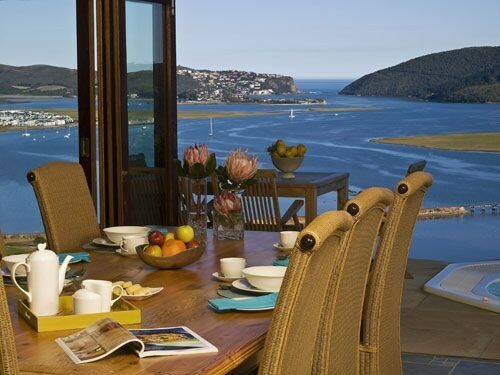 Villa Paradisa is located in the picturesque town of Knysna, in the heart of the Garden Route. 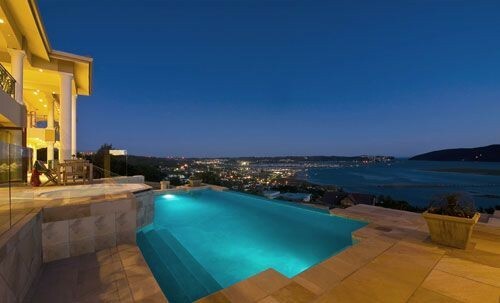 From it's elevated position, on Paradise Hill, this new Guest House commands breathtaking views of the entire Knysna amphitheatre, the estuary Knysna Heads, the island and town. Enjoy sundowners on your veranda or in the pavilion at the poolside. Watch the stars come out and the town lights reflecting on the tranquil water, before going out to dine at one of Knysna's fine restaurants. Come back to the spectacular Villa Paradisa and your inviting suite with its stylish bathroom with \tub for two", seamless glass shower, tastefully decorated bedroom and furnished veranda. Dictated by the amazing views, Villa Paradisa, has been designed to offer the best vistas and appreciation from every conceivable aspect. 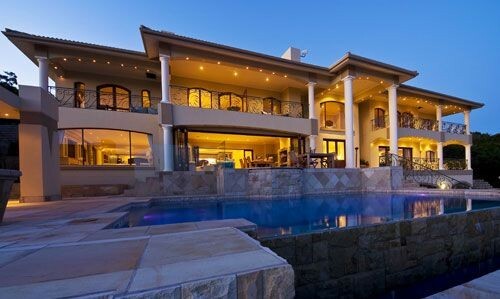 The architecture compliments the coastal lifestyle with an emphasis on outdoor living and relaxation. The finishes were inspired by the environment, from the colours of sand and sea, and textures of the natural sandstone, marble, travertine, porcelain and wood, to the wave design of the sea green balustrades. 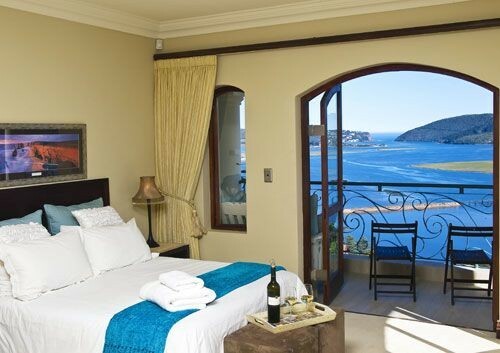 The Villa has 3 suites, individually created with style, comfort and the best views possible in mind. A 4th suite will be launched in 2009. 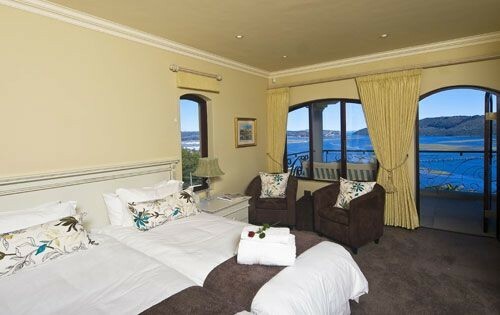 Each suite is well-appointed and spacious with fabulous sweeping views over the lagoon and through the famous Knysna Heads. Together with the bathroom and covered veranda, the exclusive space of each suite is approximately 50 sqm. Each bedroom has under carpet heating and electric fan, furnished with an eye on pleasure, and have either queen, king or twin beds with cotton percale linen. The bathrooms have bath tubs for two and separate seamless glass showers. The Honeymoon Suite or Oyster Room, has a spa bath tub with double captain seats. The taps and shower heads are Hansgrohe or Kludi. Bathrooms have under floor heating and heated tower rails. Bath sheets, robes and bath & body products are provided. The suites are serviced and in addition, a turndown service is offered in the evening, when guests have departed for dinner. In compliance with the law, smoking is not permitted in the bedrooms or any indoor areas. The Oyster Suite / The "Love Room" or Honeymoon Suite - beautiful, spacious and light open-plan room with queen bed, spa bath, seamless glass shower plus hand shower, double glass basins and separate toilet. The colour palette is sand, gold, dark wood, white linen, with touches of aquamarine. The veranda has a cushioned "love seat" for two and table with chairs. The room is equipped with two easy chairs, dressing table, TV (limited bouquet), hairdryer, fan, heated towel rail, complimentary coffee & tea selection, cotton percale linen, bath robes, fluffy bath sheets, bath & body products. Under floor and under carpet heating for the winter time. 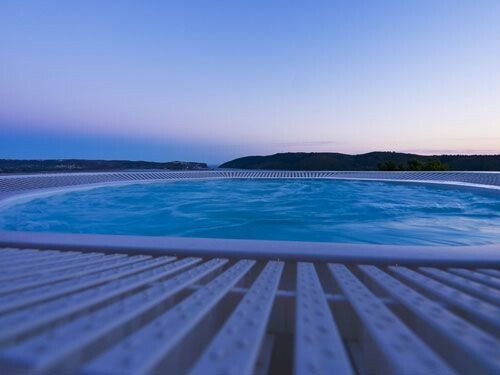 The view is fabulous, even from the shower and spa bath - over the lagoon and through the Heads, and Belvidere. Great for bird-watching in treetops on Western side. Total size including covered veranda approximately 50 sqm. The Coral Suite - gorgeous room with queen bed, bath tub for two, seamless glass shower with unique corner shower seat plus hand shower. The colours are sand, gold, French White wood, with shades of warm coral. The large veranda has a cushioned bench and table with two chairs. The room is equipped with two easy chairs, dressing table, TV (limited bouquet), hairdryer, fan, heated towel rail, complimentary coffee & tea selection, cotton percale/bamboo linen, bath robes, fluffy bath sheets, bath & body products. Under carpet heating for the winter time. 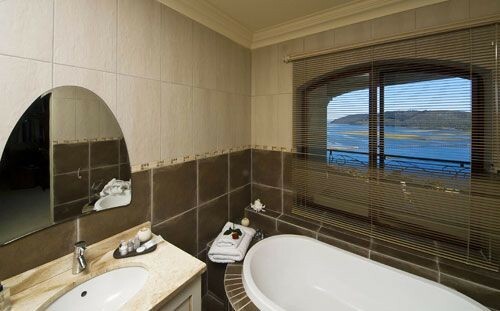 Amazing view, right through the Heads and entire lagoon, also from the bathroom. Total size including covered veranda approximately 50 sqm. The Sea Urchin Suite - lovely, sunny room with extra-length twin beds, (or king converter), bath tub for two, seamless glass shower plus hand shower. The colour palette is sand, gold, cocoa, French White wood, with glimpses of sea urchin green. The veranda has a cushioned bench and table with two chairs. The room is equipped with two easy chairs, dressing table, TV (limited bouquet), hairdryer, fan, heated towel rail, complimentary coffee & tea selection, cotton percale linen, bath robes, fluffy bath sheets, bath & body products. Under floor & under carpet heating for the winter time. Awesome view of lagoon and the Heads, town lights. Total size including covered veranda approximately 50 sqm. 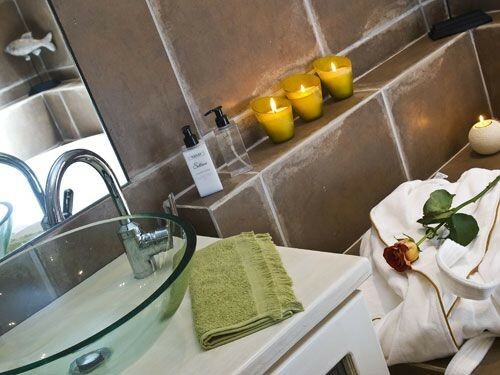 Allow our Dr Hauschka therapist to spoil and pamper you in the comfort of your own suite, lavishing you in the luxury of Dr Hauschka's 100% natural products. By addressing the skin as a holistic organ & stimulating its natural functions, Dr Hauschka skin care products encourage the skin to exercise its power of self-regeneration. Dr Hauschka is Certified Natural & Organic. BDIH Certified. 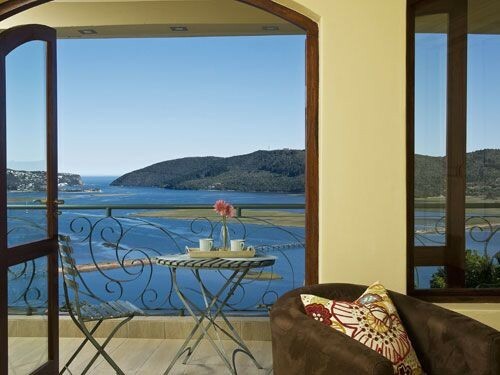 The Pearl of the Garden Route Knysna is truly what holidays are made of . . . from its unrivalled scenic beauty to its exhilarating adventure activities, its leisurely relaxing pleasures to its fine and varied cuisine . . . there is something for everyone. The lush and mysterious indigenous forests are home to ancient towering yellowwood trees draped in "old man's beard", the shy Knysna loerie with its prominent crest, striking "eye liner" and flourish of scarlet wings in flight. And, of course, the elusive Knysna elephants! This vast tidal expanse of water, is the breeding ground of the diminutive Knysna seahorse, pansy shells and a multitude of other marine life. Also contained in its waters are the Knysna oyster beds and its wetlands provide an abundance of food for numerous bird species, including the protected black oystercatcher with its distinctive orange beak. Knysna has a rich and intriguing history, from its name, meaning "place of wood", in Khoisan, the language of the earliest inhabitants of the area, to the woodcutters, timber merchants, mariners, elephant hunters, gold diggers, silk farmers and royalty . . . George Rex, founder of the town and alleged illegitimate son of King George III of England. Snorkeling, scuba diving, abseiling and rock fishing can be done at the Heads. Knysna is a golfer's paradise, with the spectacular Pezula Championship Course overlooking the Ocean and lagoon, the Simola Jack Nicklaus Signature Course with gorgeous view of the Knysna River, lush valleys and forest, as well as the Knysna Golf Course close to the lagoon. There are several other world-class golf courses in the surrounding areas, including the Gary Player designed Goose Valley, Ernie Els\' Oubaai and Fancourt Courses. Other activities in the area include whale & dolphin watching boat trips, cycling, hiking, quadbiking, paragliding at nearby Wilderness, helicopter flips in Plettenberg Bay, tree-top canopy tours in Tsitsikamma, and for the brave & daring, bungi-jumping at Stormsriver, the highest in the world! Knysna's shops offer everything from local arts & crafts and markets to trendy and sophisticated stores. A variety of fresh seafood including Knysna cultivated lagoon oysters, can be enjoyed with a glass of wine, or the local Mitchell's beer, at one of the many fine retaurants in Knysna and the Waterfront.